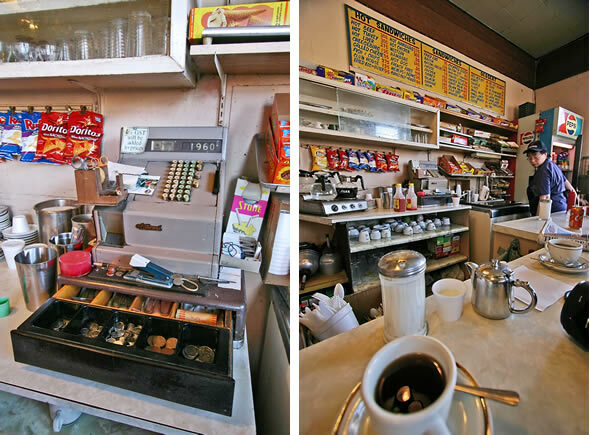 Now that the economy's sputtered and stalled worse than your over-heated vintage 1969 PX150, places like Gale's Snack Bar appear less a quaint anachronism or dusty relic than a sanctuary from the $5 lattes and $12 burgers you find littering the edges of Leslieville . Walking these isolated, empty blocks along Eastern Avenue, it's easy to see why cheap eats make sense. There's nothing much along this desolate stretch of strip besides the corpses of shuttered warehouses, the omnipresent phantom odour of fresh-baked bread bleched out of Weston Bakeries and the hoarding board promises of condo developments whose erections, thanks to our current economic woes, are now less likely than a flaccid octogenarian suffering Viagra withdrawal. So having a price point cheaper than most vending machines is pretty much a guarantee of getting butts in booths. 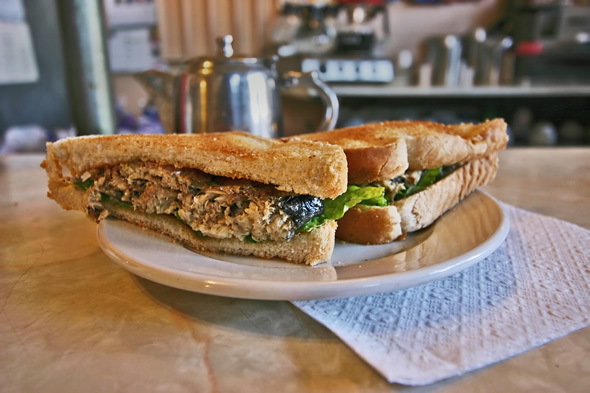 And along with some stand-bys that haven't graced most local eateries since the 50s (ummm...sardine sandwich anyone? ), there's one thing on offer at Gale's that prolly hasn't been seen in just as long: value for money. Y'see Gale's is reputed to be the most frugal diner in the city and I'm here to test the theory. Along with three hungry friends and one $20 bill, I'm hoping to see exactly how much chow we can stuff in our slavering gobs. 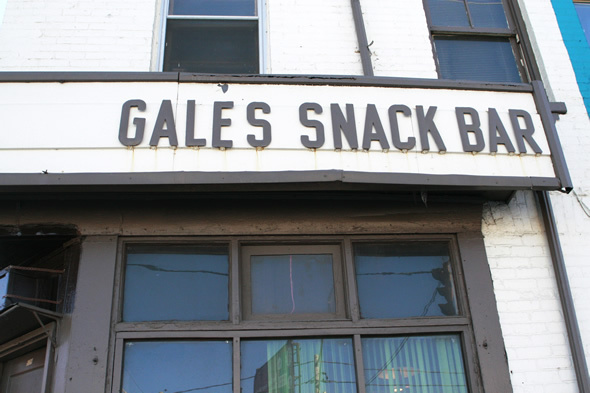 Let's get one thing straight right off the bat: there's no room for you at Gale's. At least not while we're there. 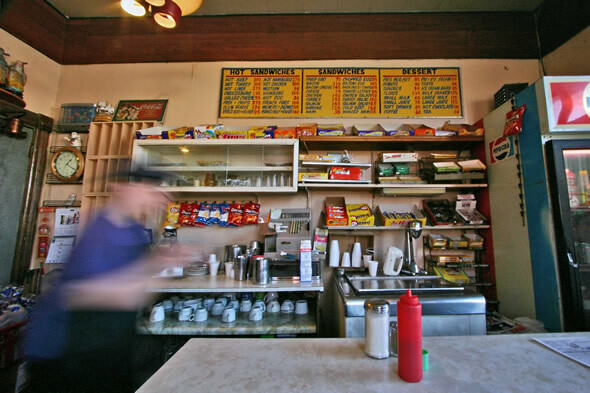 The aforementioned booths are microscopic, there are three of them, and they're all perpetually occupied by a tattered collection of skinny, hollow-cheeked old men in oversized greasy coveralls and perhaps a cowboy hat here and there for curious effect. They are the 'regulars'. And as they look up in stunned silence from their amiable chatter and their surroundings of threadbare red vinyl and mid-century kitsch, we feel like we've walked into a frontier town saloon or intruded into some strange, working-class Masonic rite as we slide up and straddle one of the eight low-slung stools that line the vintage formica of the counter. Seriously, the four of us nearly pack the place this Saturday brunchtime and I understand that even without our intrusion, on weekends it often gets busier than my favourite local food blog's layout . Luckily everyone is super friendly and a little curious at the noobs, but warm up quickly beginning a long, generously meandering conversation between strangers more than happy to share a wonderful selection of stories. Generous also pretty much describes the menu. The most expensive thing on it is $3.00 and I'm nearly overwhelmed by a familiar creeping sense of Catholic guilt, feeling like I'm about to gorge myself at someone else's expense. 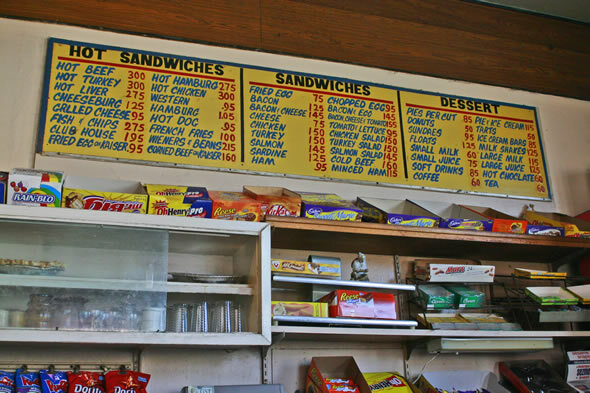 Sure the sandwiches come stuffed between slices of toasted Wonder but at $.95 for a Western, or $1.25 for the incredible, edible and surprisingly tasty time capsule that is the sardine sandwich (seriously, find me a single menu with a sardine sandwich on it nowadays) you'll definitely wonder what kinda mark-up there could possibly be on these items. 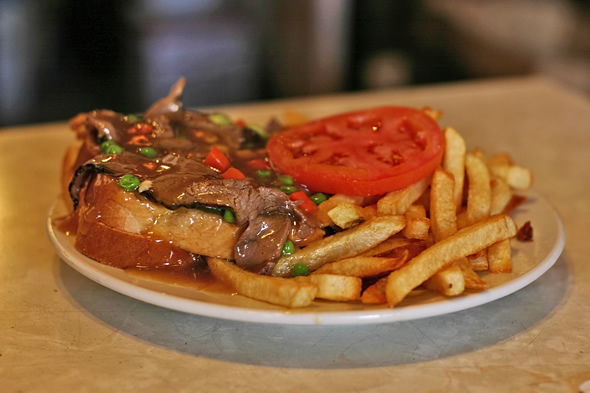 The hot turkey ($3.00) features a raft of untoasted pieces of Wonder white groaning under the weight of thickly carved slices of daily roasted bird and soaking up a smother of chinese style, soy sauce enriched gravy. A healthy pile of McCain fries, a stray pea or carrot cube and a solitary tomato slice added more for effect than anything complete the arrangement. The hot beef ($3.00) is just as good, only...well...darker. 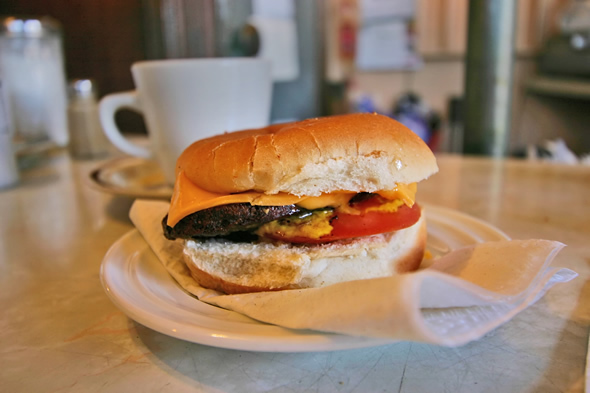 The cheeseburger'll set you back a whole $1.25 and comes with a heaping side of nostalgia as you tuck headlong into summertime cookout childhood memories courtesy the plain white bun, and the Kraft single melting happily on top of a well-charred patty. 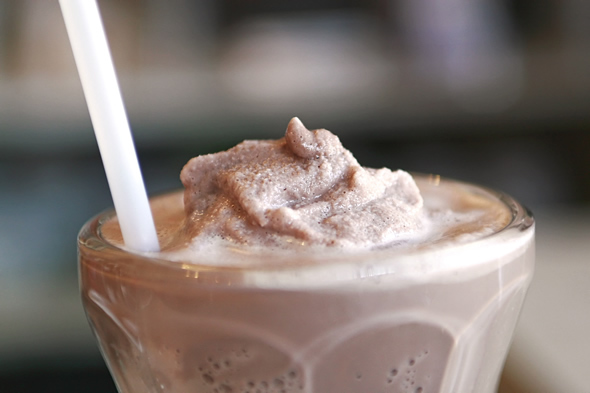 The raisin pie ($.85) is okay (kinda like a riff on a less sweet, oozy butter tart) but if you're jonesin' for dessert might I suggest the ultra-thick milkshake to sate that sweet tooth. Your standard selection of icecream flavours (Sealtest, natch) on offer, these shake's'll easily support a dozen upright straws and at $1.25, we mistakenly order too many but feel obliged to finish every delicious drop. Believe me, we were all full by the end of this meal and try as we might, taxes included, our bill only came to $19.60! Understand that this is not a chowfind or a foodie destination. 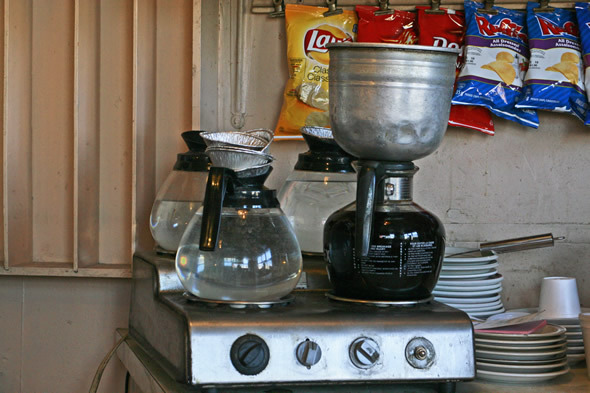 What Gale's is, is utility food served in an honest-to-goodness greasy spoon diner. This vestigial tail of a neighbourhood eatery (that maybe along with the Tulip and the recently departed Woodgreen Fish & Chips and Canary) is a dying breed in a city that's never been overly concerned with preserving its past. As I drain my cup of coffee I ponder how long this place'll be around. The chef's pushing 70 and I worry that there won't be anyone to keep this place up once he decides to retire. Best not to think about it. Thoughts and words return to convivial discussion with friends: some old and some newly acquired. I've been quickly charmed by this place and maybe if any good can come of an economic correction, it's that places like this might find patrons again and be spared the shame of being thrown on gentrification's tower of silence -- for a little while longer anyway.